Sick of getting your head perforated every round? When it comes down to facing off against someone of equal (or greater) skill, it really comes down to who can outsmart the other. So here's one great way to confuse and get the drop on your prey (or to set yourself up for filleting a noob with your knife). A pro knows how to use sound to track and anticipate his enemy, so here's a great way to confuse someone who is using sound to slay your teammates. In any level with glass, walk through pre-shot glass to trick your enemy into thinking you are going one direction, then sneak back to set yourself up for an easy headshot, flashing, or knifing. Of course you're not going to want to do this to the same person every round, vary it up, after a couple times actually go through the window and catch them watching the opposite direction for your double back. Keep 'em on their toes, and when you're matching wits with someone of equal skill you'll need to trick and get the drop on them to gain the upper hand. 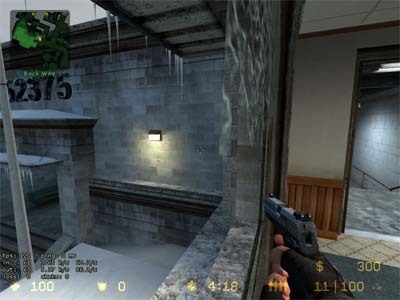 A great example is a low man startout (like 5 vs 5) or dueling the last few enemies on CS_Office. On either team, use your radar and know where your enemy is at all times. Once you have them set up in an area with glass nearby, walk through it and make them feel like they're in some sort of cliched horror movie.